In 2018, 48 Federation houses were erected in Tinasonke through the People’s Housing Process. Since 2015, however, the journey to the completion of these houses presented Federation members with many roadblocks. Federation members, in Tinasonke, utlilized community-driven strategies in order to make their dream of owning a home a reality. This blog unpacks those strategies, how they were implemented and what effect they had on the whole housing development. 48 houses were built in Tinasonke in less than one year through the Federation’s People’s Housing Process. Tokoza is located near an industrial area in the Ekhuruleni Municipality just south of Johannesburg in Gauteng Province. Across the road from Tinasonke, hundreds of people lived as backyarders in the Tokoza township. A backyarder is someone who erects a shack in the backyard of a formal house and pays “rent” to the homeowner to use the land and gain access to water and electricity. Backyarders lives are volatile. Many also follow the strict rules of the homeowner. For example, some backyarders cannot invite guests into their homes without permission from the homeowner and they must return back to the property before a certain time or they’ll be locked out of their homes. Privacy is also a major issue for backyarders. Often, families of four or more live in spaces of 30sqm or less. Mothers might sleep on the floor alongside their teenage children and couples must share tiny spaces with their parents. These relationships are aggravated by the fact that the shacks are not study structures. In the winter, the shacks are extremely cold and rain constantly leaks through holes and crevices along the ceiling and walls. In the summer, the shacks reach high temperatures; daily tasks become incredibly difficult and sleeping is unbearable. Understanding life as a backyarder not only illuminates the colossal feat the residents in Tinasonke achieved but it also provides insight into the impetus for many upgrading projects like this. When we lived in Tokoza, about 1500 of us backyarders came together in 1997 to form the Zenzeleni Housing Savings Scheme as part of what we now call the Federation of the Urban and Rural Poor (FEDUP). We wanted to improve our conditions by living on our own land and building out own houses through the People’s Housing Process (PHP). This is when we identified Caravan Park and negotiated with the owner of the land, who sold it to uTshani Fund on behalf of FEDUP in 1998 for R1.2 million. As a savings scheme we contributed R 260 000 of the cost which we used as a deposit for the land. Phaello Mmole was once a backyarder in Tokaza. Now she stands smiling in front of her PHP home. Through the People’s Housing Process, FEDUP members can directly access housing subsidies and construct houses through Community Construction Management Teams. FEDUP houses are generally 50m2 or larger, depending on the extent of additional savings.RDP houses are 40m2 in size. The PHP approach makes provision for housing beneficiaries to manage the construction of their own houses – thereby saving expenses usually issued to contractors. The Federation, specifically, as one of the implementers of PHP does this through training Community Construction Management Teams (CCMTs). Though the PHP model promotes community empowerment through transfer of skills, the Ekhuruleni Municipality withheld signing the Memorandum of Agreement—essentially the agreement that would enable Tinasonke’s Federation members to build 46 homes through the PHP approach. The local government remained doubtful of the Federation’s insistence on PHP in Tinasonke. As a result of the doubt cast over the PHP process in Tinaksonke and the delay in signing the MoA, Federation savings members were divided. Over 500 Federation members chose to pursue RDP housing with the hope that these would be constructed faster than the initially hoped for PHP houses. The remaining 48 families chose to fight for the PHP model. 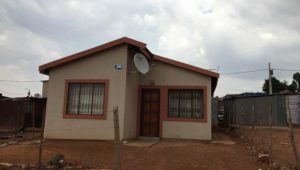 In 2015, the remaining Federation members in Tinasonke built two show houses to demonstrate the effectiveness and quality of Federation houses in Gauteng that are constructed through the People’s Housing Process. Using the community’s savings from their Urban Poor Fund, the Federation pre-financed the construction of the two houses. They used these show houses to demonstrate that the people of Tinasonke were skilled enough to build sturdy and durable homes for themselves. It was not an easy journey for the members of Tinasonke, who now own their land and homes, to get to where they are today. Several Federation members and leaders, like Cynthia Yalezo and Alina Mofokena, identified the strategies they used to mobilize backyarders and to convince the Ekhuruleni Municipality to support the PHP model in Tinasonke. The first tactic the Federation used was savings. Savings is the life-blood of the Federation. In 1997, the backyarders of Tokoza township created the Zenzeleni Housing Savings Scheme under FEDUP. 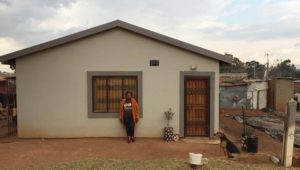 Having saved R 260 000 of the R 1.2 million necessary to purchase the land in Caravan Park, the future members of Tinasonke were well on their way to making their dreams of owning homes a reality. Through savings, every aspect of members’ lives is improved. We are able to claim a stake in land purchased by the community; they have more disposable income for food, clothing, and tuition; they are integrated into a network of neighbors and savers who have the capacity to support each other. Through FEDUP, savers can also become part of the Funeral Scheme and income generation programs like FIGP . Today, some Federation members of Tinasonke who still live in shacks, actively participate in a saving scheme of over 500 landless people. They have saved R340 000 towards prospective land and have over R100 000 in community savings. The members of Tinasonke also used what they referred to as the “Mamas’ Movement” as a second tactic. Since the construction of the two show houses in 2015, the residents of Tinasonke struggled to get the MoA signed by the Ekhuruleni Municipality. On the days that they had scheduled visits at the Provincial Department of Human Settlements office in Johannesburg, they organized over 30 Mamas (residing in Tinasonke) to sit-in the lobby while others met with City representatives. Twice, the Mamas of Tinasonke occupied the lobby of the Provincial Department of Human Settlements hoping to get answers as to why the agreements were being delayed. While the delay of the MoA could have discouraged the Tinasonke members from continuing their pursuit of housing, it actually motivated them to work harder and smarter. The Federation is active all across South Africa and has a strong reputation of mobilizing communities around savings. Making use of the Federation’s linkages to provincial and national departments of Human Settlements, Tinasonke residents saw a breakthrough on the municipal level. 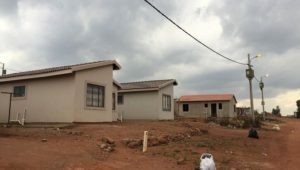 In addition to tapping into its connections, the Federation’s track-record of PHP home-building in Gauteng has been recognized by the National Department of Human Settlements. Receiving numerous honors like the Govan Mbeki awards (issued by the National Department of Human Settlements) for the PHP houses they built in Orange Farm and Duduza, the Federation made a convincing case for the implementation of the PHP model in Tinasonke. (Read more about FEDUP’s award winning projects here). The residents of Tinasonke, along with national FEDUP coordinators, were nothing if not persistent in their engagement with the local government. When invited to government meetings, the Federation used these spaces as opportunities to speak about Tinasonke even if the settlement or its problems were not listed on the agenda. Through their efforts, the members of Tinasonke had the MoA with the Alberton Provincial Department of Human Settlements signed in April 2017. Constructed PHP house in Tinasonke. An integral part of the People’s Housing Process model is the formation of the Community Construction Management Team (CCMT). In Tinasonke, the CCMT consisted of four to five Federation members located within the community. Tasked with monitoring the construction of homes, the CCMT is trained by other experienced Federation members. In addition to the site-specific workshops, local exchanges are done in the province so that the CCMT can see what appropriate PHP housing should look like. If community members are already equipped with the skills to work in construction, then they are contracted to build. If the CCMT cannot find members who can build, then they will first look to neighboring communities for support before eventually outsourcing the contracts. In Tinasonke, the CCMT did more than just oversee the construction. Phaello Mmole and Cynthia Yalezo, members of the four-person CCMT, painted all 48 houses themselves because they wanted the spaces to feel like proper homes. The Federation in Tinasonke constructed 46 homes in under 7 months. That averages to 6.5 houses per month or 1.6 houses per week. Federation savers and homeowners meet outside of their community hall to discuss the way forward for other backyarders who continue to save despite being landless. 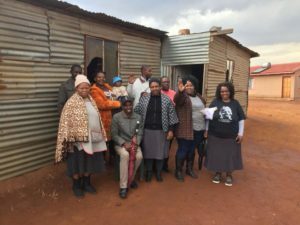 Ask the residents of Tokoza or Tinasonke what their dream is and surely, they will say that they want to own land, own their home, or even have their own bedroom. For 48 families, this dream was realized in January 2018, when the last PHP house outlined in the MoA was built. Amidst celebrating the completion of 48 PHP houses Rosie Mashimbye, Federation coordinator in Gauteng, speaks of the struggle that over 500 landless Federation members face in Tinasonke and the surrounding area. For me it is still hard because I don’t have a house. I still live in the shack house. And without a house, you can’t think properly. You can’t invite people to come drink tea with you. But if you have a house, you can invite friends to drink tea. The next steps for Tinasonke involve mobilizing the former FEDUP savers in Tinaksonke who are no longer active. Federation leaders explained that local exchanges between informal settlements in Gauteng can give hope to the savers and the landless which helps to see the benefits of reengaging and contributing towards community saving schemes. In July 2018, the residents of Tinasoke are having discussions with the Ekhuruleni Muncipality once again about the possibility of a multi-purpose centre that can be used a creche, church space, Federation office, and community hall. The goal is to accommodate anyone and everyone who wishes to support Tinasonke or join a Federation saving scheme.